At the 2018 Winter NAMM Show, Apogee previewed their new plugin software, DualPath FX Rack, exclusively designed for Ensemble & Element interfaces. In a recent update on their website, they have now announced further progress to their plugins, which they are now calling Apogee FX Rack. "We’re making great progress on the first 5 plugins for Ensemble and Element Series interfaces but we need a little more time. Although we are closer to a release, we want to ensure the sound quality along with the experience of using our first plugins is amazing." "The Modern EQ offers a sleek, feature rich interface with unique controls like Console and Precision FX Voicing an advanced analyzer and our DualPath recording functionality. And our models of vintage EQ and compressor hardware are turning out to be among the best we have ever heard. We’re working on light and dark themes too." 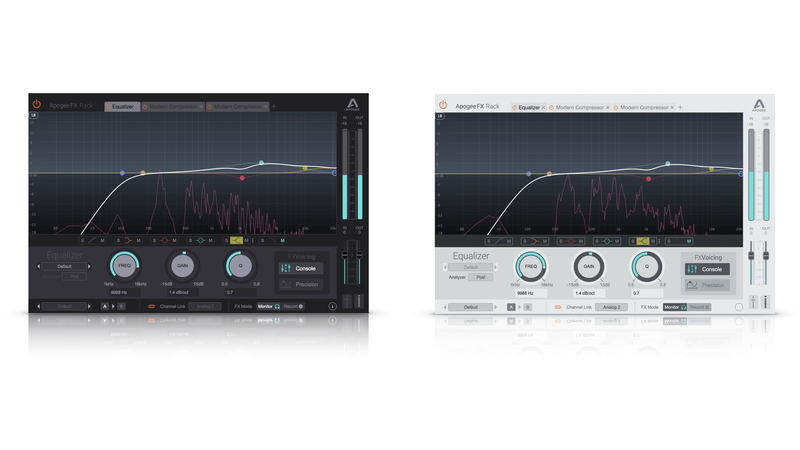 Run Apogee FX Rack plugins completely from your DAW – no need to switch between apps. All Apogee FX Rack settings are stored and recalled within your DAW session. Apogee FX Rack plugins remain active on playback even if Apogee hardware isn’t connected. Control and automate Ensemble and Element preamp settings, and built-in mixer, from the Apogee FXRack plug-in in your DAW. The ApogeeFX Rack for Ensemble and Element Series interfaces is set for release in October of 2018. For more information and updates, visit Apogee's website and sign up to their newsletter. Visit our Apogee product page for more information on Apogee interfaces & software.